Add ingredients in order listed in mixing bowl and mix well at medium speed until thoroughly blended, for 2- 4 minutes. Stop part way through to scrape the sides of bowl. Pour batter into prepared pans. Bake at 350 for 35 – 45 minutes. Frost when cool. I have never yet been able to keep the middle from falling on this cake, but no matter. This frosting recipe covers it so thickly that you don’t notice a sunken middle when you’re done spreading it. Stir pudding into one cup of the heavy cream and let set for a few minutes. Then add remaining ingredients along with rest of cream and beat until fluffy. Spread onto cooled cake. Coconut Cream Cake—Make as directed throughout, substituting instant coconut pudding mix for the pistachio, including the frosting recipe. 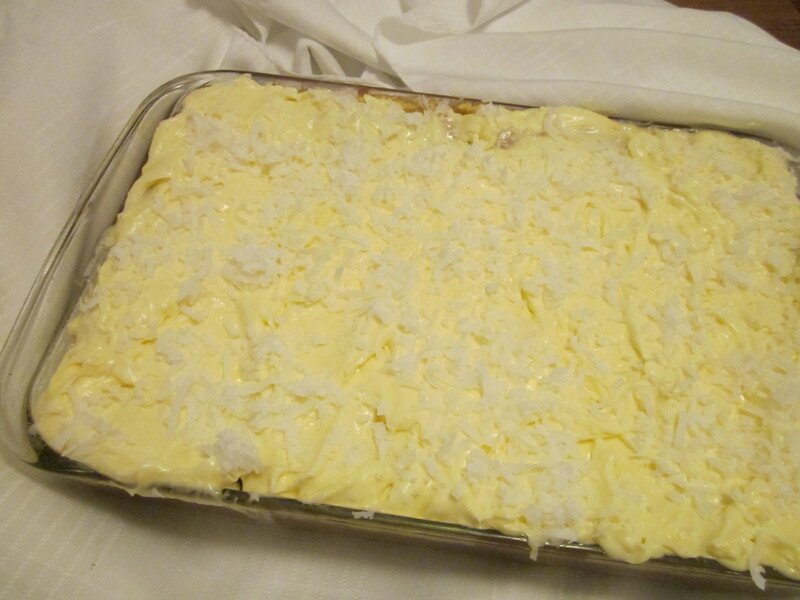 After frosting, sprinkle top of cake liberally with sweetened, flaked coconut.